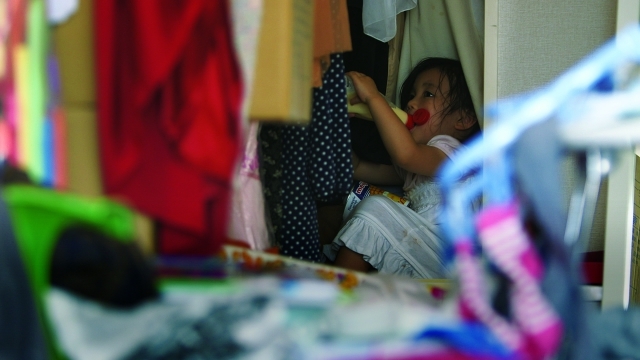 OSAKA —A 25-year-old mother whose two young children starved to death surrounded by rubbish after she locked them in her apartment has been sentenced to 30 years in jail. Single mother Sanae Nakamura regularly left her daughter, 3, and one-year-old son, in the apartment in western Osaka while she spent the night at her boyfriend’s house, reports said. She had begin leaving them alone in March 2010, the Asahi Shimbun said, adding that sometime in early June that year she stopped coming home. But when she did eventually return later that month the two tots were dead, the paper said. Dan Kisah ini telah difilemkan pada tahun 2013 Mengisahkan seorang perempuan yang ditinggalkan suami. Selepas ditinggalkan, hiduplah dia dengan dua orang anaknya, Sachi dan Sora. Dipendekkan cerita, Sachi dan Sora mati sebab mak diorang tinggalkan diorang dalam apartments tanpa makan dan minum. Memang tragis dan kejam. Ada banyak lagi scene yang menyayat hati sepanjang Sachi dan Sora ditinggalkan terkontang-kanting dalam apartment berdua sehingga mereka terpaksa makan apa sahaja yang tinggal didalam rumah tersebut...merukapan sebuah kisah sedih yang pasti menyentuh hati anda. Sunk Into the Womb begins as a tender, credible everyday depiction of a loving mother (Emiko Izawa, The Unbroken, Zettai reido: Mikaiketsu jiken tokumei sôsa) whose world revolves around her two young children, but her marriage is on the rocks. Her husband’s ‘late nights’ are soon explained when he announces he is leaving her and the children for another woman. Within the confines of her flat – which director Takaomi Ogata (Body Temperature, Never Ending Blue) never steps beyond – we see her obligation to her children become a prison. Finding work at a hostess bar, she finds an escape that also leads to new relationships, however fleeting they might be. But when one new beau invites her to go away with him for a few days, she leaves her children behind anxiously awaiting her return. What happens next is a parents’ worst nightmare of what their children might get up to if their backs are turned for five seconds, from raiding the cleaning cupboard to trying to open cans with sharp knives or playing with large plastic bags. Ogata’s approach may be a little sensationalised, but the naturalistic, unforced performances he gets from child actors Kino Tsuchiya and Aoi Tsuchiya make it believable and all the more horrific to watch. Ogata builds the character sympathetically; we see her turn from talented and resourceful homemaker to lonely single mother, yearning to break free of the confines of the flat and stress of bringing up her children alone. There are suggestions that her actions might be a cynical depression, perhaps repressed by a seemingly happy marriage, rather than any wanton malevolence; pulling common threads with Shinya Tsukamoto’s Kotoko, where a single mother suffers from a particular mental disorder and depression. Shooting from knee height, a child’s eye-level that takes on greater relevance as the film progresses, there’s deceptively unfussy camera work by Takashi Horinouchi as we watch the debris mount up on the floors. There’s effective parroting of the opening scene with the mothers period, as the young girl cannot get to the toilet so has no choice but to go where she stands. He uses long takes that let the action shift into focus, rather than follow it eagerly. This effect pushes adults heads out of shot, deliberately disembodying them. And yet this disembodiment also distances us from the mother and her emotions. Upon her return to the flat, her impassive, matter-of-fact responses to the repercussions seem to further push us away from sympathising with her actions. However natural a reaction that might be for someone in shock, it creates an uncertainty; making those actions seem almost premeditated and undermining some of the initial portrayal of her character. Unfortunately this results in preventing us from associating with mother on a personal. The raw, thorny subject matter will no doubt will have audiences raging ‘how could you’ at our lead, rather than question how or why, which is the director’s original pretext. Ogata’s understated direction within the constricted location of the flat is stunning. Despite the minimal location, this doesn’t look cheap or unconsidered. His appreciation for pace and holding that imagery for longer than is comfortable makes for haunting and emotional viewing. This is just the sort of film that will fair better in a festival environment where audiences are more prepared to be challenged than in any sort of commercial setting or wider release, and that is a shame: this deserves to be seen.